After 15 days of tug of war between pre poll aligned Congress parties at last today Ashok Chavan will take oath and form the government. The people of Maharashtra must have been in a mind of fix as to why it took so long for pre poll aligned parties to form a government. Better late than never. But, now what about Karnataka; where a Natak is being played starring our CM BSY and Reddy brothers and all others are on the side line. 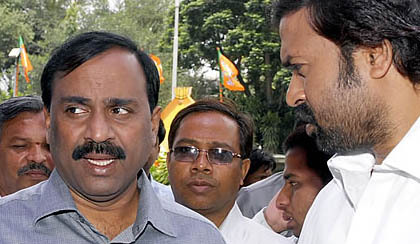 The natak is being produced by the BJP in technical collaboration with Reddy’s. Most of the Natak has been played outside state like Hyderabad, Goa and Indore where the Reddy camp is camping and our CM is busy shuttling between Bangalore and Delhi. And today in the afternoon BSY claims that the Natak will end and the crisis is over which has been settled by the central leadership. 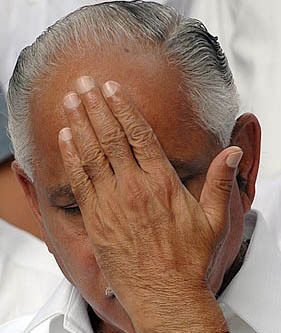 But the Reddy’s aren’t ready to go with this, they still say they are not happy with BSY and won’t cooperate with him. For these past 10-15 days expect what work must have been done at the Vidhan Soudha. All our problems are waiting to be addressed but the biggest question to all who will answer. The political crisis is taking a toll on flood relief work in Belgaum, where about 70,000 houses collapsed during the recent deluge. Work on rehabilitating the villagers has gone off track as all top BJP leaders in the district, which produced 11 MLAs and three MPs for the party, are engrossed in the ongoing political tussle. At least six MLAs and two MPs have openly come out in support of Chief Minister BSY while five legislators are backing the Reddy brothers. Of the four ministers, Laxman Savadi, Basavaraj Bommai and Umesh Katti want Mr Yeddyurappa to continue as CM, while public administration minister Balachandra Jarkiholi, remains with the Reddy camp in Hyderabad. The Belgaum and Chikkodi MPs and Rajya Sabha MP Prabhakar Kore are trying to drum up support for the CM. MLA’s are not answering their phones and in this time of crisis has distanced legislators from voters at a time when they are needed here. Suresh Angadi has proposed the name of Member of Parliament Ananth Kumar for the post of Chief Minister, dismissing Jagdish Shettar’s claim. What will be the end of this natak is not known as the script is being re worked and some final touches to the climax are being given. This natak seems to be a daily soap like the ones of Balaji telefilms(here also its starts with ‘K’ Karnataka). Everyday something is happening and the climax is getting bigger and bigger. As viewers we are all bored of this and now have to decide on what to see and what not? Cannot we decide what we want to see; after all it’s the tax payer’s money that is funding the Natak. What will happen keep glued to the ‘Kar-Nataka’.